Simply put, Jefferson did not have the financial resources necessary to free his 260 slaves. In these three articles about Jefferson and slavery we anticipate and address the rebuttal Barton offered in his World article. Barton claims that Jefferson didn’t have the money to free his slaves. However, Jefferson had enough money to buy and sell slaves over the course of his life while other owners were freeing their slaves. Barton changed his argument a bit in the World article putting more emphasize on Jefferson’s financial status. Jefferson’s spending deserves a book but suffice to say that Jefferson spent money freely on fine goods and continual renovations to Monticello. The truth is that Jefferson had financial resources (slaves, lands, goods, etc.) very few other Virginians had. His choices about how to use them is at issue. On Friday, we posted part one of our response to David Barton’s appearance on the Glenn Beck Show (8/16/12). On that show, Barton defended his claim that Virginia law did not allow Thomas Jefferson to emancipate his slaves. In The Jefferson Lies, Barton does not cite the part of the 1782 Virginia law that allowed slave owners to emancipate their slaves. In his book, Barton does not mention that owners were allowed to free their slaves during the life of the owner and gives no explanation for why he omitted that portion. During his appearance on the Glenn Beck Show, he mentioned the section of the law that allowed manumissions, but gave no explanation about why he failed to include it in his book. On the Beck show, Barton said Virginia law required slave owners to provide a security bond for emancipated slaves. Since Jefferson was often in debt, he was unable to provide these funds for his slaves. Part of the problem in getting clarity has been Barton’s presentation of the evidence in The Jefferson Lies. He says on page 94 that “Jefferson was unable to free his slaves under the requirements of state law…” Actually, Jefferson was able to free his slaves after 1782 in accord with the provisions of the law on manumission. Barton is now arguing that Jefferson’s inability was financial and not legal. On the Beck show, Beck made an analogy to small business owners in the present. He said that one is allowed to start a business but the government regulations make it so difficult that it is practically impossible. To accept that analogy as relevant, one must find evidence that Virginia government regulations prevented manumissions. To be sure, during the years between 1782-1806, there were government regulations (writing a deed, and a small clerk’s fee for filing the deed), but they were not so onerous that manumission was impossible, as is demonstrated by the many private manumissions and the large one of over 450 slaves initiated by Robert Carter. And most important for Barton’s financial argument, we can find no evidence, nor has Barton presented any, that security bonds were required for slaves who were in the proper age range and of sound mind and body. As we demonstrate below, the evidence Barton presents does not relate to Virginia. Subsequent laws imposed even harsher restrictions, mandating that a slave could not be freed unless the owner guaranteed a full security bond for the education, livelihood, and support of the freed slave. The footnote at the end of that sentence is to an 1857 book by W.O. Blake titled, The History of Slavery and the Slave Trade, Ancient and Modern. Barton cites page 386 as his source for this information. Below is the entire page 386 from that book. Instead of a reference to Virginia law, this page completes a discussion of the fate of children born of black and white parents and begins one on emancipation in Massachusetts. The Virginia Assembly, on the motion of Jefferson, prohibited in 1778 the further introduction of slaves. In 1782, the old colonial statute was repealed which forbade emancipations except for meritorious services to be adjudged by the governor and council. This repeal remained in force for ten years during which period private emancipations were very numerous. But for the subsequent reenactment of the old restrictions the free colored population of Virginia might now have exceeded the slaves. Maryland followed the footsteps of Virginia both in prohibiting the further introduction of slaves and in removing the restraints on emancipation. Note that private manumissions were numerous according to this source used by Barton. Actually, the significant restrictions were not added until 1806. There is nothing mentioned here about a security bond. In part three, we will address the remaining claims about slavery. 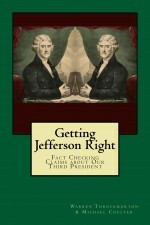 On Thursday August 16, Glenn Beck had David Barton on to “clear the air” about The Jefferson Lies. Our impression is that Mr. Beck is a very loyal friend and his loyalty is preventing him from objectively considering the evidence. A more objective approach would be to have had someone else on the show to counter Barton’s claims. That did not happen even though there was some discussion of evidence. In any case, there are several clips of the broadcast posted on The Blaze website. During the broadcast, Beck said he would never promote another Thomas Nelson product. Given that statement and others, we think Thomas Nelson should come out with details about their rationale for pulling the book. Since we have not spoken with Thomas Nelson about Barton’s book, we don’t know what their specific problems with the book were. I say you could free your slaves at death like George Washington, and I say because of the laws, you couldn’t free your slaves. The point I make throughout the whole chapter is that there’s a whole bunch of laws Jefferson had to deal with. Barton says our whole rebuttal is based on that 1782 law. At the point Beck takes a swipe a me because I am a psychology professor, completely ignoring my co-author Dr. Coulter. It continues to amaze me that Barton supporters use that defense since Barton is not a professor of history. Barton then said we don’t take into account other laws in Virginia relating to slavery which he said prevented Jefferson from freeing slaves. On the program, Barton listed laws passed in 1778, 1791, 1793, 1795, 1798, and 1802 as relevant to emancipation. In The Jefferson Lies, when he takes up the issue of Jefferson and slave owning (pages 91-94), Barton refers to laws dated 1692, 1723, 1782, and 1806. He only quotes part of the 1782 law (leaving out the part of freeing slaves by deed) and then says that the 1806 law changed the conditions for emancipated slaves. Barton is correct to say that the burdens on both master and slave were added to make emancipation a more difficult proposition after 1806. However, between 1782 and 1806, slave owners did, in fact, free slaves. Jefferson freed two slaves and he could have freed more. On the Beck show, Barton then referenced various other slave laws passed between 1778 and 1802. There is another law (1785) that he didn’t mention as well. We will take up this list in part two of this series. However, as far as we can tell, none of these laws encumbered owners in ways that prevented owners from freeing able bodied slaves. Some related to treatment of slaves and others related to rights of slaves to petition for their own freedom. We did not say Jefferson could have easily freed all of his slaves. We agree that there were some financial considerations involved for some slaves. In keeping with provisions with the 1782 law, slaves which were judged not to be of sound mind or were infirm or above age 45 or below the age of 18 for women and 21 for men required the guarantee of the master for their care. However, there were many slaves owned by Jefferson which were of sound mind, and between these ages which could have been emancipated. None of those slaves would have needed a pledge of support from Jefferson. Since Jefferson could have freed some additional slaves between 1782 and 1806 and did not, then Barton’s description of Jefferson as “a bold, staunch, and consistent advocate and defender of emancipation and civil rights” can reasonably be questioned (The Jefferson Lies, 113). On the Beck show, Barton then brings up the 1814 letter to Edward Coles where Jefferson said “the laws do not allow us to free them [slaves]. It shall have all my prayers, & these are the only weapons of an old man. But in the mean time are you right in abandoning this property, and your country with it? I think not. My opinion has ever been that, until more can be done for them, we should endeavor, with those whom fortune has thrown on our hands, to feed and clothe them well, protect them from all ill usage, require such reasonable labor only as is performed voluntarily by freemen, & be led by no repugnancies to abdicate them, and our duties to them. The laws do not permit us to turn them loose, if that were for their good: and to commute them for other property is to commit them to those whose usage of them we cannot control. I hope then, my dear sir, you will reconcile yourself to your country and its unfortunate condition; that you will not lessen its stock of sound disposition by withdrawing your portion from the mass. That, on the contrary you will come forward in the public councils, become the missionary of this doctrine truly christian; insinuate & inculcate it softly but steadily, through the medium of writing and conversation; associate others in your labors, and when the phalanx is formed, bring on and press the proposition perseveringly until its accomplishment. Coles wanted Jefferson to be more involved in efforts to end slavery and informed him that he wanted to leave the state to free his slaves. It is important to note that Jefferson advised against this abolitionist move. Jefferson urged him to stay and maintain the status quo all the while “softly and steadily” work for emancipation. In this letter, Jefferson claimed the law did not allow owners to “turn them [slaves] loose.” This was technically incorrect even in 1814, as emancipation was still an option for owners. However, as we say in our book, the situation became much more difficult in the practical sense after 1806. Jefferson’s complaint about the law at that time was more of a practical restriction than legal one. However, between 1782 and 1806, Jefferson, like Robert Carter and other Virginia slave owners, was legally able to emancipate a good number of his slaves. In fact, as we point out, but have never heard Barton address, Jefferson did free two slaves, one in 1794 and the other in 1796. Barton’s reference to the 1814 letter to Coles is not relevant to the legal situation between 1782 and 1806. Barton and Beck discuss Jefferson’s financial situation as a barrier to emancipation. We agree that financial considerations were relevant to Jefferson since he considered slaves to be his property. However, this is a different set of factors than the legal ability to emancipate his slaves. Barton inappropriately cites Jefferson’s 1814 statement as covering the years between 1782 and 1806. The law allowed emancipation during that period for slaves, as we noted above. In our view, Barton does not consider the economic issues from all angles. Slaves were costly to keep (even for the slaves which required security, emancipation might be cheaper since he had to provide for them anyway) and owners had to pay taxes on them. In some cases, it might have been more economical to emancipate slaves rather than pay taxes on them and for their care. Furthermore, Jefferson bought and sold slaves as well as leased them from other slave owners. Important considerations relating to Jefferson’s financial situation were his continual building at Monticello and his acquisitions of finery from Europe. A fuller treatment of Jefferson’s finances would be necessary to discuss his actions toward his property (slaves) but one cannot say he was unable to free his slaves due to Virginia law, especially during the period between 1782 and 1806.